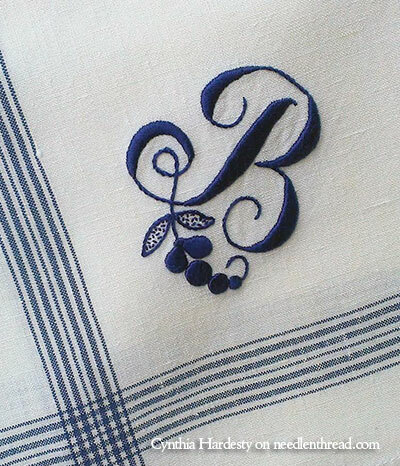 I have A Thing for hand embroidered monograms. I love them – and it doesn’t matter whether they’re my initials or not. I just love them. Embroidered monograms are popular these days. 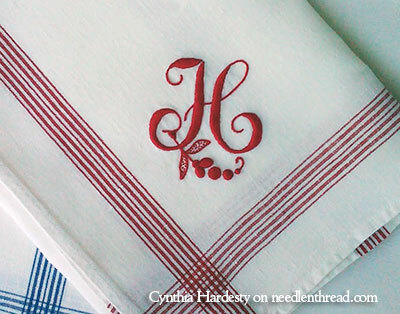 If you don’t believe me, search “embroidered monogram” on Pinterest, and you’ll come up with a whole slew of them – enough to keep you busy browsing for hours! 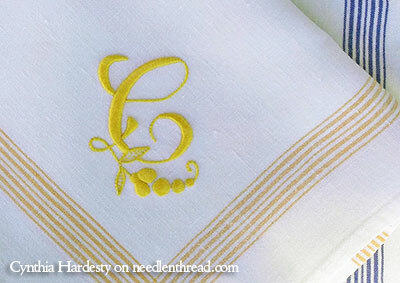 So I was delighted to receive several emails from readers here on Needle ‘n Thread who have been dabbling with embroidered monograms in a variety of styles, and it is my pleasure to share these masterpieces with you! Click on the photo above, and you’ll see the monogram better. Stitching thousands of French knots in the same colors as the background fabric and following the pattern in the fabric meticulously, Kerry created a subtle but fascinating R. She used my French knot video tutorial to get the hang of the French knot. I would imagine that, before she was too long into this project, she was a pro with it! To put it into perspective, the hoop is an 18″ quilting hoop. The French knots are made with three strands of DMC floss. And there are approximately 11,300 French knots in the whole letter. It took Kerry about 60 hours to embroidery this, and believe it or not, she’s still in love with French knots! She said she loves doing them, and she loves the way they feel when they’re done. She’d like to French knot a whole piece of fabric and cover a binder with it! I’d like to see this piece up close – and run my fingers over it at the same time! 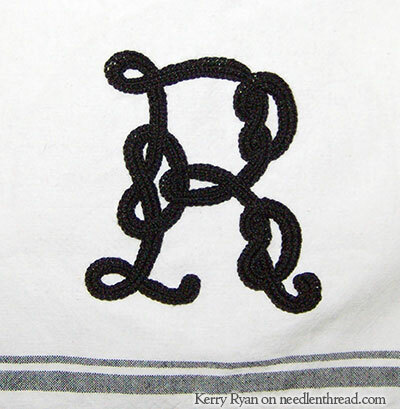 Kerry also stitched this Celtic monogram R on a tea towel for her mom. She used the Celtic monogram alphabet for the letter. Following the instructions in the Plaited Braid Stitch printable, she worked the R in plaited braid stitch in #5 perle cotton. Just in case you thought plaited braid stitch should only be worked with metal threads, now you know! 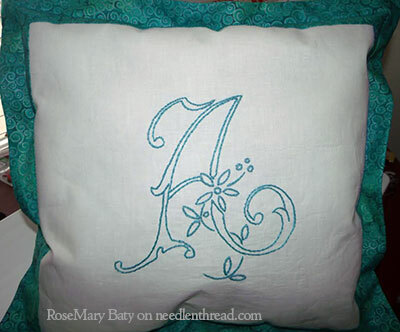 RoseMary worked the monogram A from another monogram alphabet offered here on Needle ‘n Thread. She used 6 strands of DMC to stitch a large A for the middle of a cushion, using split stitch. I love the idea of large monograms on cushions. It’s such a great way to personalize a room! RoseMary’s cushion is a perfect example of how one stitch in one color on one design can create a very nice gift. 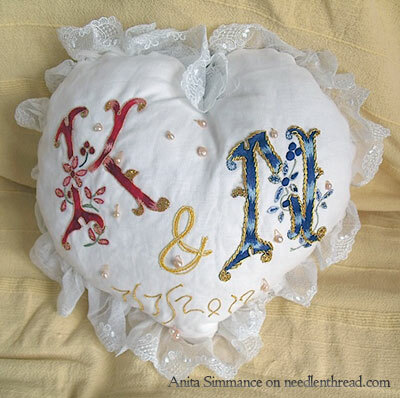 Using the same alphabet that RoseMary used, Anita embroidered a K & N on a wedding pillow, using variegated threads in long and short stitch. A lovely, sweet memento! 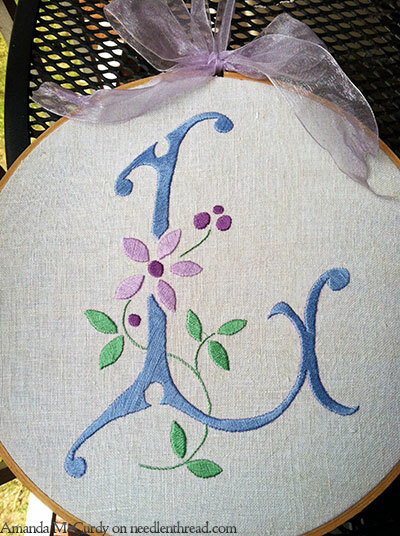 And using the same alphabet, Amanda McCurdy embroidered this beautiful L in satin stitch as a gift for her grandmother Leatrice’s 90th birthday. It is perfectly satin stitched – so pretty! And another hand embroidered L. Heather embroidered this beautiful floral L monogram after seeing these floral monogram kits from French Needle mentioned on Needle ‘n Thread. Oh, joy! If you don’t read the comments on Needle ‘n Thread fairly regularly, you might not be familiar with Sarah. She’s a very interactive reader here on Needle ‘n Thread – her comments always make me smile! 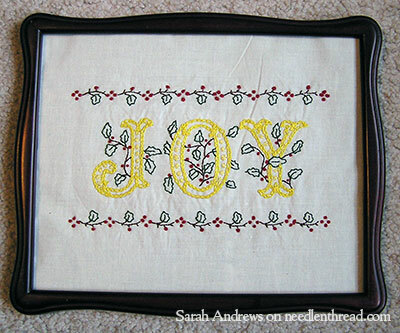 Sarah stitched up this Holly & Joy design available here. The design is made up of three decorative initials put together into one word (you can read about the process of combining those letters into one design here). For this project I used all DMC 6-stranded cotton embroidery floss on a white linen. The stitches I used were backstitch, chain stitch, daisy stitch, and french knots. I like to keep things simple with my embroidery; simple stitches, simple threads. When I was stitching this project, I had gotten two of the letters’ yellow chain stitch done thinking, Yay! Only one more letter to go! Then I went to start on the last letter and ran out of the yellow thread. Problem was, I didn’t know what number the thread was! So I had to go to the store and hold up this scrap of yellow thread to a whole bunch of different skeins until I found the right color. I think she did a great job on it, and I really like the finish. That style of frame is perfect for a one-word piece of embroidery – very reminiscent of the older Victorian paper embroidery mottos! 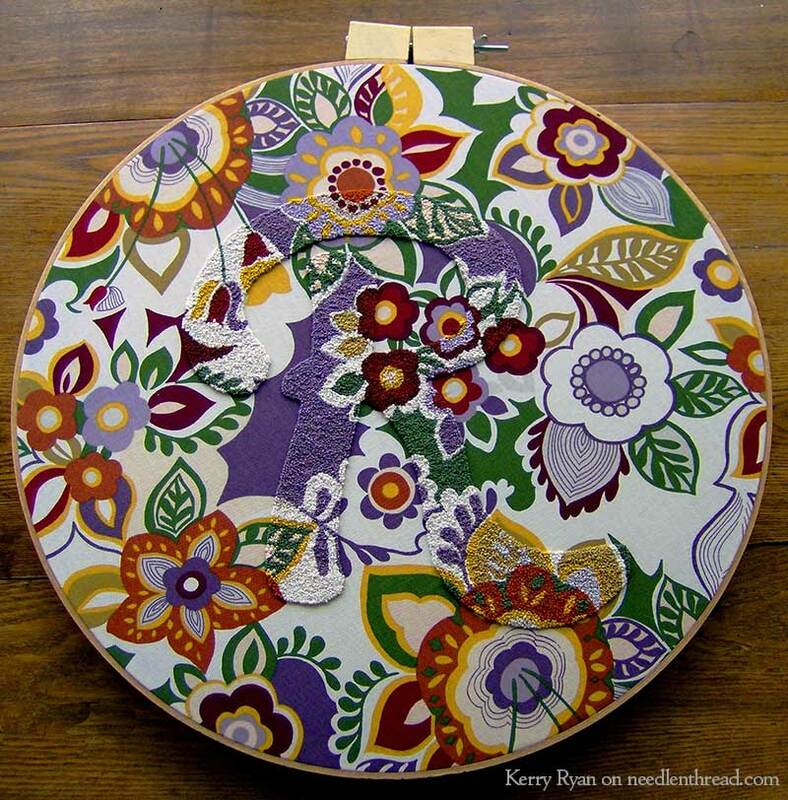 Can you guess what inspired Bronwen’s illuminated embroidered C? You guessed it – the Secret Garden project! The C is worked in couched metal threads, and the whole piece is mounted in what looks like the cover of a book or journal. I love the combination of monograms or decorative initials with goldwork – and I’d love to cover a book this way! 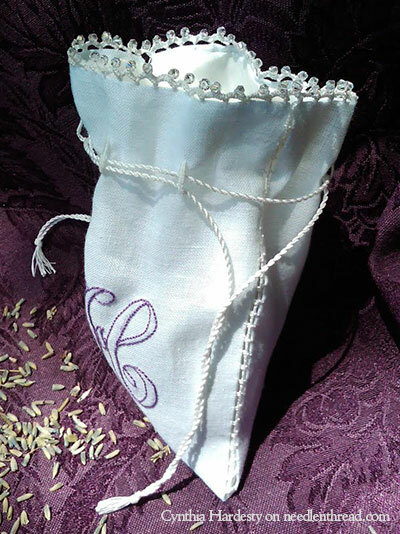 Cynthia, a member of the Sand Dunes chapter of the EGA (Sun Region – Florida), worked a beautiful example of a shadow work monogram on this pristine linen pouch. The inspiration for the embroidery came from this demonstration of a shadow work monogram. …and a B in blue. I was so excited to see so many monograms among your photo contributions! I never grow tired of them! 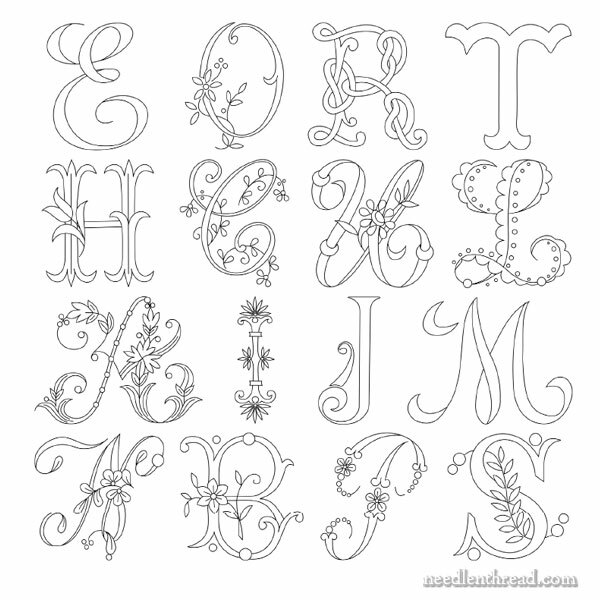 If you’re looking for monograms to hand embroider, you’ll find 16 beautiful decorative alphabets – many of those featured in the projects above – all in one place in Favorite Monograms, a downloadable PDF collection of 16 monogram alphabets perfect for hand embroidery and other crafts. Lovely is right! What fun and inspiring work to look at this morning. Thank you all for sharing. I have hesitated to try monograms thinking it would be boring. Wow! Was that thought wrong. Thank you for the cheerful images this morning. I was curious as to what Kerry is going to do with her “R” – leave it in the hoop or use it for something like a pillow. I can’t imagine 60 hours and then having to sew it into something. Those would be well planned seams! 🙂 Her work is beautiful. Thanks for sharing all the monograms. Lovely work by all! Carrie thank you for your kind comment. I actually left it in the hoop. It was a gift for my Mom last (2013) Mothers Day. I made her pick out the fabric without telling her what I was going to do except that she would hang it on her wall. I stitched silk ribbon flower embellishments on the backing and put the date, number of knots and hours worked on it…wishing her a happy Mothers Day. Everyone should be super proud of their efforts. It’s great to see all of the different ideas and applications for monograms that everyone created. WTG! 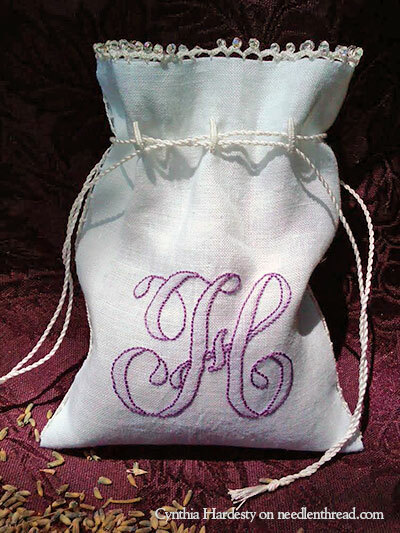 Monograms are what I DESPERATELY want to excel in stitching. DESPERATELY! The above examples from readers are inspiring. Mary,are you still going to offer a course? Please. A lot of beautiful work! I don’t think I can name a favourite but the french knotted R would have to be the most unusual. Sarah sounds so grown up and did a great job of finding a matching yellow for the last letter. Thank you everyone for sharing your lovely work! I love seeing everyone’s stitching! What beautiful monograms I love the first photo the subtle R it’s incredible all those French knots embroidered in the same material pattern. I really like Heathers L from The French Needle beautiful all of them are unique with different styles used lovely. Thanks for sharing this with us Mary I really like these readers embroidery very inspiring. Thank you for sharing all these beautiful embroidery, this is a real explosion of joy. The girls are really talented, this is a joy to behold all these wonders.Many inventiveness and a good example of working points. I love! Thank you again Mary. Every single project is absolutely stunning! Still I must say that the 1st R is also gorgeously NUTS! I can’t imagine having the patience to do so many French Knots. I can’t even do them the “proper” way so I created my own. Still, I couldn’t do it. BRAVO! And BRAVO to everyone else. My humble photos would humiliate and damage the prestige of this awesome site! Thank you and NUTS! is the right word. So lovely and such variety! 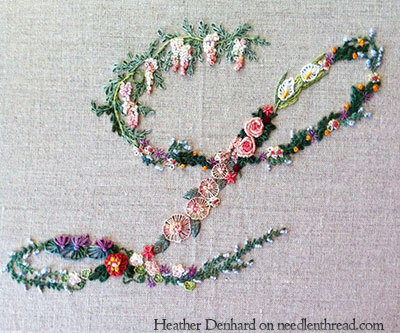 I have never seen anything like that french knot initial. I stared at it a long time, trying to figure out how it was done, before I read your commentary. Wowsers. Eleven thousand three hundred French Knots! My, my, my. I don’t think I would’ve had the patience for that. I love French Knots in and out and upside-down, looking at them, feeling them, and embroidering them, but I do tend to get impatient working a LOT of them. I think you did a great job with them, Kerry. I, too, Mrs. Corbet, have A Thing for hand-embroidered monograms. I like them. But Holly & Joy is the only monogram project I’ve done. I’ll surely do more in the future, though. Everyone’s projects look great! Thanks again, Mrs. Corbet, for this opportunity. It’s so fascinating and inspiring to see what other embroidery enthusiasts have been doing. Thank you for your kind comments on my French Knots. Believe me I wouldn’t have had the patience to do it at your age either. But as you will undoubtedly hear as time goes by (cause that’s what old-er people do)…..patience comes with age. At some point I was unable to put it down and after 8 hours of stitching found myself still twisting knots at 3am. I was actually bummed when it was finished. Thank you for showing us all the beautiful work done by your talented reader/embroiderers. Each piece if different but all are equally beautiful. One of the best things about embroidery is that you have something to show for your efforts. Mary, since you could not get to the shop outside Nashville right away, you might want to plan a “rest stop” there on your return trip! Before my retirement I did a lot of driving for work. If I passed a place that looked interesting, or heard about something that was not open when I would be passing I made a note of it and planned to stop the next time I went that way. I ended up visiting many great places, and had a few that I went back to on a fairly regular basis. I was preaching to my people the importance of taking rest breaks every couple of hours when they were driving, so I HAD to set a good example …. Such fabulous work! I love monograms, haven’t done any yet but I have all sorts of plans. I’d love to know where to buy glass cloths like Cynthia used, are they a standard easy-to-find thing? Thanks so much for sharing all of the lovely work of your readers, and thanks to all of the readers for sharing! This is fantastic and inspiring. Last Saturday, I came across a shop in Brentwood, TN, just outside of Nashville. It is a Bernina Sewing Machine Store located at 91 Seaeboard Lane #102, P. 615/373-1600. I saw some beautiful linen glass towels and guest towels. They had sets of linen coaster, and even linen table runners. The cost on the linen towels was around $4-5. I checked the label and was surprised to see 100% linen that looked beautiful for that price. They had various colored borders that were already hem-stitched and ready for embroidery. The quality looked nice – it had a fairly even weave, nice body, not a heavy thing, but a delicate piece ready for a beautiful hand-worked monogram. I did not buy them when I was there, and knew when I left the shop,I would regret it…..now more than ever because of seeing these beautiful pieces! They have pre-made “Blanks” for embroidering for babies, like bibs,and such in various cottons. By the way, they have lovely fabrics, too. Everything in the shop was very nice quality for heirloom sewing, quilting and machine embroidery. I hope it’s OK to share this with everyone. Funny… In about 1.5 hours I’ll be driving right past the on I-65… Don’t think they’ll be open this early! Wow, everyone has such nice crisp lines! I’m jealous. What beautiful work! Kerry’s french knot monogram is truly inspired! A “JOY” to do and to enjoy for many years to come. I was very surprised when I opened my email this morning to see a picture of the French Knot R on your blog. You must have been on that galloping horse when you looked at it because there is nothing “meticulous” about it up close….none-the-less Thank You so much for your inspiring words. Thank you ALL for your kind comments. It was a labor of love. Seeing (and reading about) projects that your followers have done is great fun. Lots of inspiration! Next Next post: The Eye of the Needle Exhibit – and Why Frogs?